This thin Aluminum RFID card sleeve wallet encases your credit and ID cards and keeps your identity safe! 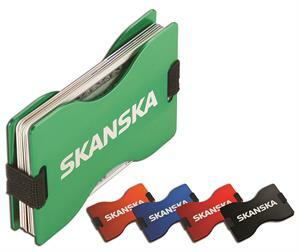 Can hold 6-8 credit cards or 10-15 business cards. Your logo can be printed in one color or laser engraved. “RFID” is engraved on the back, bottom right corner. Colors: Black, Lime Green, Orange, Red or Royal Blue. Price includes one standard imprint color or laser engraving on one side only. 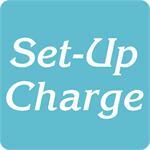 Add a set-up charge of $50 on new orders; $25.00 on re-orders. For Multi-Color imprint on one side, add one $95 Mult-Color set-up charge PLUS .95 each per extra color. For logos: Add a set-up charge of $50 on new orders; $25.00 on re-orders. Normal production time is 1 week. For multi-color imprint orders that require a set-up charge of $95.00. Additional charge per color also applies.